This is a monumental production that richly deserved re-screening in this Britten Centenary year, when it is also enjoying a revival on the Glyndebourne stage. This is the first appearance of Britten’s 1951 masterpiece at Glyndebourne. As is usual it uses his condensed 1960 two-act version, which lasts for approximately three hours. In describing something that seems to achieve perfection in just about every way, it is hard to know where to begin, but the beginning seems appropriate. Out of the darkness we meet John-Mark Ainsley’s dignified and elegantly voiced Captain Vere, alone and disconsolate, a broken man musing on the failings of his past that still haunt him. As his prologue draws to an end we are transported back to the H.M.S. Indomitable of 1797, as Christopher Oram’s magnificent and monolithic set draws into view. By the time the boarding party have arrived with their three pressed men, we are already immersed in the atmosphere of a ship heading into conflict, eager to make amends after two degrading mutinies in the wars with the French. Now the trio of Lieutenant Ratcliffe, Sailing Master Flint and First Lieutenant Redburn are assembled. Darren Jeffrey, Matthew Rose and Iain Paterson work together here in splendid voice as they do throughout. 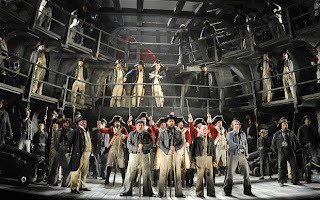 Billy Budd, beautifully characterised by Jacques Imbrailo, meets his nemesis Claggart, Master at Arms, and we immediately begin to see the tension of what is to become a fateful and fatal relationship between flawed good and perfect evil. The move to Vere’s cabin is achieved simply by dropping a wall from the flytower to close the set in further and create the intimate space. It is in the next scene change that the full force of the London Philharmonic is really apparent, under the masterful direction of Sir Mark Elder. Elder is here in his 100th opera, and only such an experienced hand could draw the kind of sonic immediacy and power from the pit. The interlude, incorporating the gentlemen of the Glyndebourne chorus, accompanies one of the masterstrokes of the setting, as Oram’s “roof” of beams descends as if to crush the cast below, and Constable’s lighting script consigns us to the claustrophobic depths below decks. It is in this third scene that we really sense the self-loathing in Phillip Ens’s Claggart. His almost drooling obsession with Budd and his piercing, hollow gaze are genuinely terrifying and we see layers of hatred and longing in his descent into some sociopathic madness as he determines himself to destroy this “handsomeness and beauty”. Almost more terrifying is Billy’s unerring faith in his superiors, even when urged to caution by Jeremy White’s compelling Dansker. The first act ends with the spectral figure of Claggart, revealed by the flying of the roof, as Budd reaffirms his confidence in “Jemmy Legs”. Act two begins as Claggart tries to convince Vere of Budd’s mutinous intentions. He is stopped in his tracks by news that an enemy ship has been sighted. The ensuing call to action is a coup de theatre, with onstage drummers on every level of the set pounding out their martial rhythm, reinforcing the already urgent sounds of the orchestra and chorus. The excitement is palpable as the sailors smell the enemy and rejoice in the prospect of a battle. They fire a round of cannon but the weather defeats them, as the wind drops and the mists rise, depriving them of a full engagement. Claggart takes the opportunity to entreaty the Captain again, and although Vere disbelieves the accusations against his favourite he calls Billy to his cabin, where Claggart finally confronts him with his lies. Here Jacques Imbrailo affects the most violent of nervous stammers and is unable to defend himself with anything but the doubly fatal blow. The trio of Lieutenants and Sailing Master return to form the drumhead court and the inevitable verdict is delivered out of vision by Vere, in an orchestral interlude of shattering power, after which we find ourselves incarcerated with Billy as he contemplates his inevitable fate. The execution scene is masterfully treated, with Billy’s friends tying the knot and taking the strain as he is led offstage to his end. This is yet another musical and dramatic triumph, and it leads to the final epilogue in which, in a nod to the close of act one, we see a spectral Vere looking over his older self as he begins his closing monologue. This was the operatic debut for stage director Michael Grandage, and it is impossible to point to a flaw in his concept, which is to present Britten’s vision as truthfully and as simply as possible. Tom Roden’s movement direction gives an authenticity to the ensemble scenes on this stunningly lit set. The cast of men and boys are joined by an all male Glyndebourne Chorus, all of whom not only sing as though their lives depended on it but can actually act as well – A master class in choral acting. The London Philharmonic are at the very top of their game under the direction of Mark Elder, whose vision of this music is astounding. This score can barely ever have sounded so immediate. From the sparse beauty of the contemplative passages to the shattering weight of the drama, surely you would need to go a long way to convince anyone better of the genius of Britten’s work here. 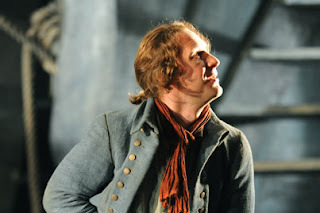 The production has received a revival at this year’s Glyndebourne festival, where Imbrailo is joined by a new cast and the orchestra is conducted by Andrew Davis. It also plays in a semi-staged version at the BBC Proms on 27th August. The 2010 cast can also be seen in the same live capture, committed to DVD and BluRay, available on the Opus Arte label. Treat yourself to something very special.